Jagruti's Cooking Odyssey: Why you should use Buckwheat ? I knew what was Buckwheat flour, in Hindi aka Kuttu Ka Aata and in Gujarati Kuttu No Daro, which I use to prepare Farali recipes but never came across Buckwheat Groats until I saw a small packet of Buckwheat in a health shop a few years back. I was intrigued, quickly checked nutritious value on the pack, without giving a second thought I bought Buckwheat and came home. As soon as I reached home, I searched about Buckwheat on Google, I was amazed to read that how highly nourishing, energising Buckwheat is! As I read on, I was getting excited to use Buckwheat, I thought that Buckwheat is right up my street. No wonder Buckwheats are often called-superfood, They are an excellent source of vitamins and minerals with health benefits. 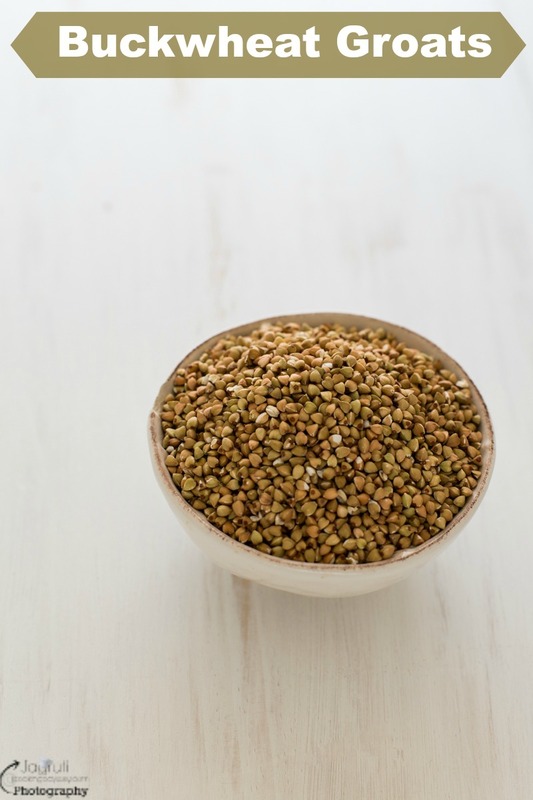 Buckwheat is not a grain, it is a fruit seed and not in any way related to wheat, therefore Indians use Buckwheat flour in making the fasting food. Buckwheat is full of high essential nutrients and gluten free. The nutrients in Buckwheat may help in controlling blood sugar levels and can help prevent diabetes, especially if Buckwheat groats are consumed. Buckwheat improves health by lowering lowering cholesterol and blood pressure levels. Buckwheat provides a highly digestible protein containing eight amino acids, also help fight disease like Cancer. I was impressed and pat my own back for buying such a wonderful product for my family. Next day, according to packet instructions, I cooked Buckwheat and used in one of the recipes, took us more than an hour to finish that dish, due to the stickiness of buckwheat or simply we weren't ready to accept new flavours and textures. Since that day I did not touch Buckwheat therefore not many recipes of Buckwheat on this blog, however, I did include various kinds of super foods like quinoa, amaranth, bulgar wheat, farro, chia seeds, cacao nibs and much more. After I joined Pinterest I saw many Buckwheat recipe pins, I felt like using it and once again I reintroduced Buckwheat to the family. Surprise surprise four of us are enjoying to the fullest almost 3-4 times in a week, stay tuned for some tasty and easy to prepare buckwheat recipes. Buckwheat is becoming very popular for many good reasons amongst westerners, are you eating Buckwheat? If not, you may consider using it. Trust me you won't regret it !! I've seen and used buckwheat flour. Buckwheat crepes are so delicious. The first time I saw buckwheat groat was my sister in law made it like khichdi during ekadashi. Love the info on the health benefits of buckwheat.